The New York Knicks have two games coming up against the Philadelphia 76ers, one today and the next tomorrow evening. Interestingly enough, despite the games being in such quick succession the bookies have given them completely different odds. 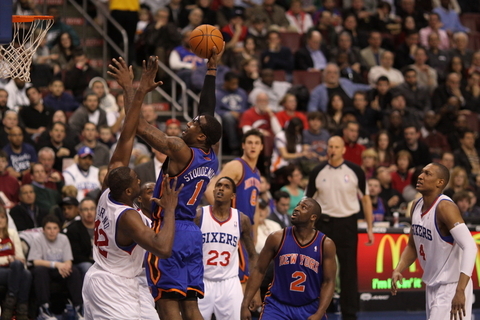 Today the Knicks are favourite to win with odds of 11/18, the 76ers have odds of 17/11. However, tomorrow the 76ers are ahead with odds of 4/7 and the Knicks have odds of 16/11. At present the 76ers are lacking their cherished centre Andrew Bynum due to a sore knee. The team that plays in both matches will probably be the same that appeared last Friday in a preseason match against Miami Heat. Lavoy Allen replaced Bynum; however, it was Spencer Hawes who was really impressive in the first game. Hawes will probably start in centre against the Knicks and Kwame Brown is also expected to be back on the team. The Knicks are also suffering from injuries; both Tyson Chandler and Marcus Camby are currently suffering from the flu and calf strain respectively. Amar’e Stoudemire is also off with a knee injury. It is unusual to see teams play two matches against each other in such quick succession and its sure to generate some intense competition.